Riding a strong anti-incumbency wave against the Congress, the BJP today wrested the hill state of Himachal Pradesh winning 44 seats in the 68-member Assembly. 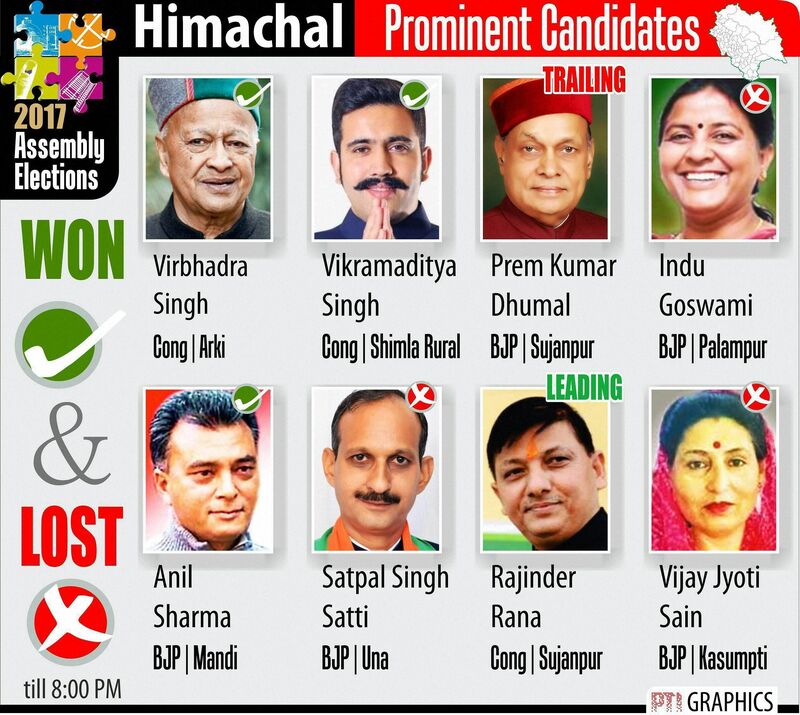 SHIMLA: Riding a strong anti-incumbency wave against the Congress, the BJP today wrested the hill state of Himachal Pradesh winning 44 seats in the 68-member Assembly, even as the saffron party's chief ministerial face Prem Kumar Dhumal suffered a shock defeat. The BJP just fell short of a two-thirds majority by two seats while the Congress, led by Chief Minister Virbhadra Singh, could win only 21 seats. CPI (M) bagged one seat while two seats were won by Independent candidates. The ruling Congress was completely wiped out in Mandi district, where nine out of ten seats were won by the BJP with an Independent winning one seat. The only consolation for the Rahul Gandhi-led Congress was that Himachal Pradesh has a history of changing the ruling formation at its helm every five years. For the Congress, Chief Minister Virbhadra Singh won the Arki Assembly seat while his son Vikramaditya Singh won from Shimla (Rural). Senior-most minister in Virbhadra Singh's cabinet Kaul Singh was humbled in Drang while his daughter Champa Thakur suffered defeat at the hands of BJP's Anil Sharma in Mandi. Sharma, the son of former Union minister Sukhram, had changed sides just before the election. The biggest setback for the BJP was Dhumal's loss to Congress's Rajinder Rana in Sujanpur, a seat which the former chief minister contested from instead of his bastion Hamirpur. Dhumal was made the chief ministerial face of the BJP only nine days before polling. Another major shock in an otherwise impressive triumph for the BJP was the defeat of state BJP chief Satpal Singh Satti in Una. Besides chief minister Virbhadra Singh, his three cabinet colleagues Sujan Singh Pathania, Mukesh Agnihotri and Dhani Ram Shandil retained their seats. However, five other ministers Kaul Singh Thakur, Prakash Chowdhary, Sudhir Sharma, G S Bali and Thakur Singh Bharmouri were humbled. In the biggest Kangra district also, the Congress could win only three out of the 15 seats, while the BJP bagged 11 seats there. BJP gained one seat each in Bilaspur, Chamba and Una districts and two in Shimla district while the Congress wrested one seat each in Solan and Hamirpur districts. Out of the three tribal constituencies of Kinnaur, Lahaul and Spiti, and Bharmaur, the BJP wrested the Lahaul and Spiti and Bharmaur while Congress retained only Kinnaur. The new faces that won in the election, included 17 from the BJP, four from Congress and two Independents. Both the Independents who won -- Hoshiar Singh and Prakash Rana -- defeated BJP stalwarts Ravinder Singh Ravi and Gulab Singh from Dehra and Jogindernagar seats respectively. The prominent Congress leaders who lost, included Kaul Singh, Prakash Chowdhary, Thakur Singh Bharmouri, Sudhir Sharma, (all cabinet Ministers), Chief Parliamentary Secretaries, Mansa Ram, Sohan Lal, Rajesh Dharmani, Rohit Thakur and Jagjivan Pal and sitting Rajya Sabha member Viplov Thakur. Of the 19 women candidates, only four could register a win. Rita Dhiman, Kamlesh and Sarveen Chowdhary of the BJP won from Indora (SC),Bhoranj (SC) and Shahpur seats respectively while Asha Kumari of the Congress retained her Dalhousie seat.